Every Cloud Productions will adapt classic Australian novel Seven Little Australians in a four-part television series. Following on from the success of Miss Fishers' Murder Mysteries, Every Cloud productions will tell the story of seven unruly, mischievous and Australian children in four one-hour episodes. Exectuvie producer, Deb Cox, said Seven Little Australians was a celebration of the uniquely irreverent, anti-authoritarian Australian spirit as embodied by the mischievous Woolcot kids, "who refuse to fit into the English mould imposed upon them by their Anglophile father." This adaptation of Seven Little Australians has been developed by Elizabeth Coleman for Every Cloud Productions. The series is being developed as part of Every Cloud Productions’ Parlay Program with the support of Screen Australia Enterprise Industry funding. Every Cloud is also developing the on-line drama series Deadlock, which will be developed through a unique emerging writers workshop in the Northern Rivers region of NSW with the UK writer of Skins, Bryan Elsley. Executive producer, Fiona Eagger said it was a hugely exciting production for Every Cloud. "We are thrilled to have obtained permission from Ethel Turner’s granddaughter, Philippa Poole, to adapt the novel for the screen," she said. "Ethel Turner’s estate has also been granted access to all of Ethel Turner’s diaries and we plan is to make a companion documentary piece on her life." Eagger said Every Cloud Productions was uniquely placed to bring Seven Little Australians to life for a post-millennial audience. 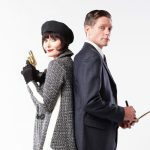 "Our adaptation of Kerry Greenwood’s popular Phryne Fisher books, Miss Fisher’s Murder Mysteries, is celebrated on a global scale for its high production values, lavish costumes and meticulous attention to period detail," she said.